The Season Starter Pool is AWB’s early season pool offered around the time of planting and is run over a 12 month period. The pricing mandate in place for the Season Starter Pool is designed to capture pricing opportunities from the time you commit to the program and to ensure that the manager can participate in marketing opportunities across the pricing window. 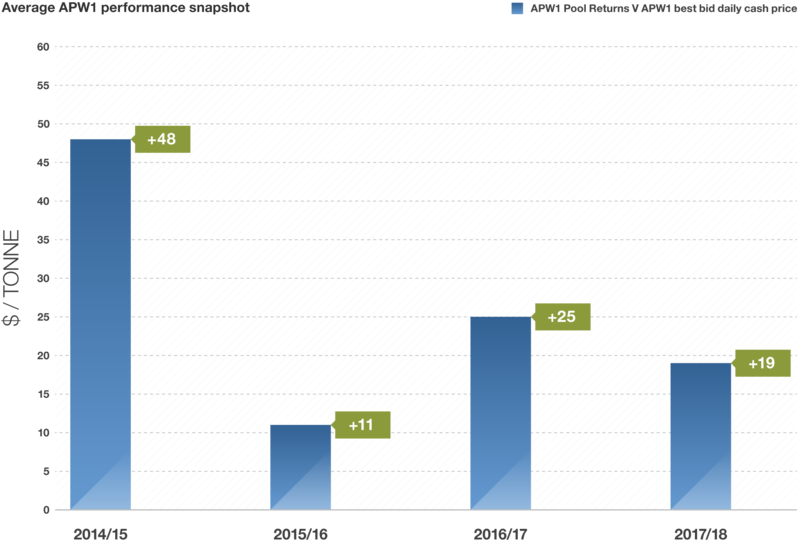 The Season Starter Pool objective is to outperform average cash values across the marketing window. 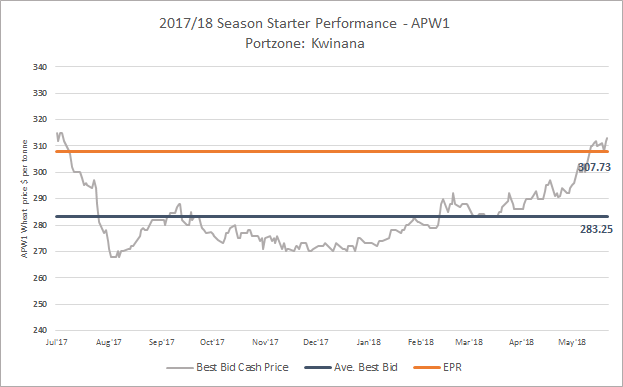 The AWB Season Starter performance objective is to outperform the average of the best bid cash price across the marketing window. 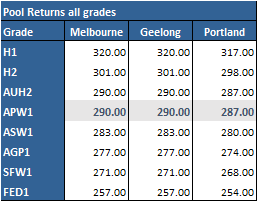 This chart illustrates Season Starter performance over the last four years on a national basis by taking an average of all portzones. This demonstrates that we have consistently achieved our performance benchmark. 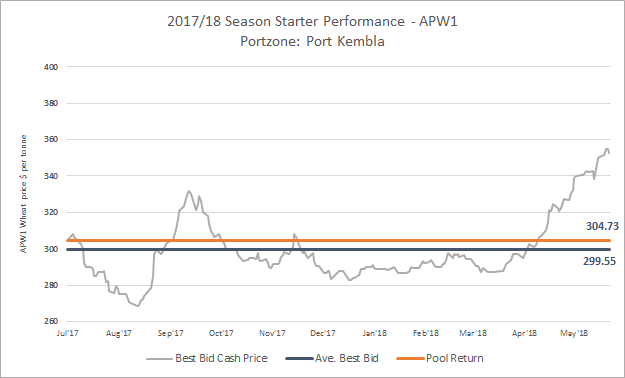 For each season, Season Starter performance is determined by comparing the final APW1 pool returns across all portzones as an average to the APW1 best bid daily cash price in each portzone over the Season Starter marketing window as an average. The Season Starter marketing window commences at contracting and runs through until pool finalisation. 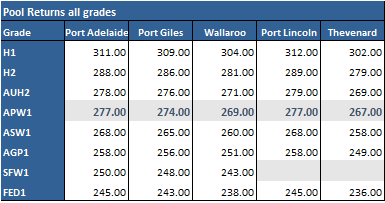 The APW1 best bid daily cash price is calculated by taking the Profarmer Port zone index price for APW1 each day and calculating an average APW1 best bid price across all portzones. The Profarmer Port Zone index is derived by taking the best bid at every up country site, adding the GTA location differential based on the natural terminal port to calculate a port equivalent best bid cash price, and takes an average of all the best bid prices. Values in the chart are rounded up or down to the nearest dollar. 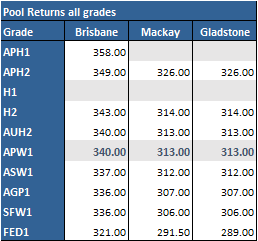 In WA, prior to September 2014, best bid cash prices represent prices for APW2 wheat. 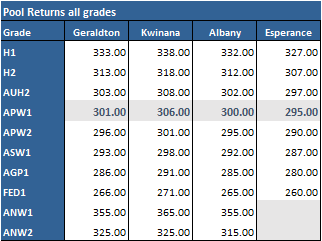 An individual grower’s returns would be different from the final Average APW1 Season Starter Return (port zone) dependent on location, grade and finance option. 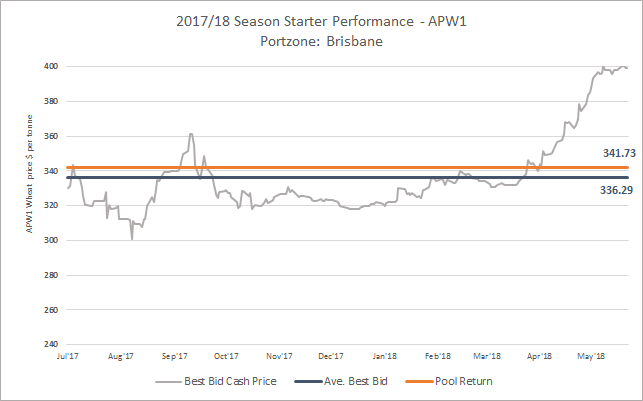 "Pool performance: The charts illustrate the performance of the Pool returns for APW1 versus the average of the best bid cash prices across the Season Starter marketing window. The Season Starter marketing window commences at contracting and runs through until the final pool payment date. 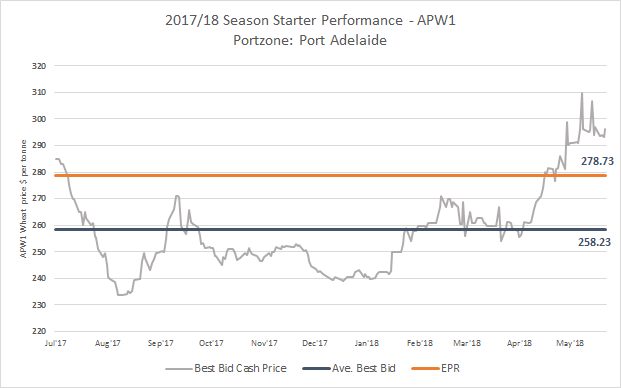 The Best Bid Cash Price represents the Profarmer Port zone index price for APW1 each day and the Ave. Best Bid is calculated as an average of the daily Best Bid CAsh Price. The Profarmer Port Zone index is derived by taking the best bid at every up country site, adding the GTA location differential based on the natural terminal port to calculate a port equivalent best bid cash price, and takes an average of all the best bid prices." 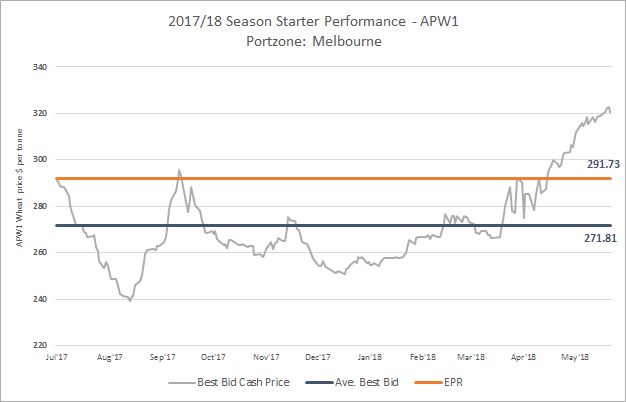 "Pool performance: The charts illustrate the performance of the Pool returns for APW1 versus the average of the best bid cash prices across the Season Starter marketing window. The Season Starter marketing window commences at contracting and runs through until the final pool payment date. 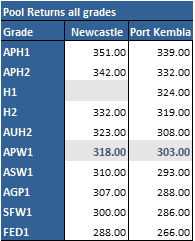 The Best Bid Cash Price represents the Profarmer Port zone index price for APW1 each day and the Ave. Best Bid is calculated as an average of the daily Best Bid CAsh Price. The Profarmer Port Zone index is derived by taking the best bid at every up country site, adding the GTA location differential based on the natural terminal port to calculate a port equivalent best bid cash price, and takes an average of all the best bid prices. Contracting into the 2018/19 Season Starter Pool is now closed.